The Hungarian government recently recalled its ambassador to the Netherlands after the Dutch Ambassador to Hungary, Gajus Scheltema, drew parallels between the government’s efforts to “create enemies” and those of the Islamic State group. In an interview Scheltema also criticized Hungary’s treatment of asylum-seekers and the government’s campaign against philanthropist George Soros. Hungary’s Deputy Prime Minister Mr. Zsolt Semjén (left), Mr. Dzsingisz Gabor wearing the Commander’s Cross (right). Considering the tension in Hungarian-Dutch relations I found the timing of his award unusual and asked Mr. Gabor about it. Here is his response. 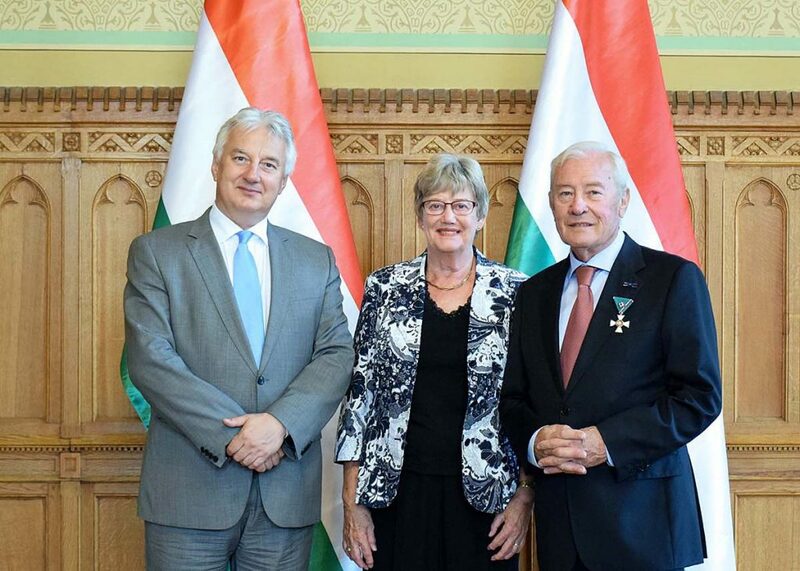 In reply to your first question: why did I accept the State Award from the Hungarian Government out of the hands of Mr. Semjén, I answer that I consider it a great honour to be awarded the Commander Cross with star by the Hungarian President, Mr. Áder. In the motivation for the award the president points to my activities with regard to agriculture and my activities to promote the good image of Hungary. In the past 60 years I have been happy to promote the good image and the reputation of the country where I was born and I hope to be able to do so in the future. To your second question: would I think that the timing of my award was influenced by the diplomatic discussions between Hungary and the Netherlands, I must answer no. President Áder signed the document with the motivation on July 24th. The interview with Ambassador Scheltema in the weekly 168óra to which you refer was published a month later on August 24th. By the way, I hope that the discussion about this article will soon be closed. Hungary and the Netherlands have a very good and deeply founded relationship which goes back to the time of the Reformation and has been renewed time and again. I hope to have answered your questions sufficiently. I thought Mr. Gabor’s last name was Khan, as in Dzsingisz Khan. His slight of hand – the equating of the Fidesz government with the people of Hungary – is similar to the Hungarian PM’s affinity fraud. When he lost the 2002 election, Orban declared that the nation can’t be in opposition. In Holland, opposition parties are still recognized as members of the nation’s fabric. 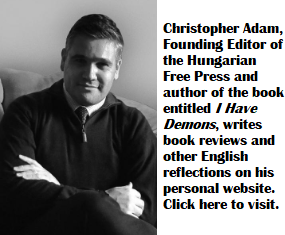 In Hungary, liberals, and critics of Mr. Gabor’s hero, are branded as traitors, and anti-Hungarian hate mongers. (Behind closed doors they are simply dismissed as Jews, or cosmopolitans.) If the EU is dying, it is of people like Dzsingisz. What could have motivated some parents to name their son “Dzsingisz”, or even Jingis ? They do not use that name even in Mongolia any more. Nem tartom szerencsésnek, hogy a Holland és Magyar helyzetet összehasonlítod, mert Hollandiában egyik oldal nem fasisztázza a másikat. Ez csak nekünk magyaroknak jutott osztályrészünkké nemutolsó sorban az észak-amerikai, magukat magyarnak mondó, szélső liberális intellektuális terroristáknak. Attól tartok, hogy Magyarországon nem lehet rendet teremteni a fejekben addig míg szabadon, minden következmény nélkül lehet egymásra alapozatlan vagy legalábbis bizonyítatlan bélyegeket nyomkodni. Amig Lázár elvtárs a napi mocskolódásai után még mindíg szabadon nyaralhat a leköpködött őshazájában annélkül, hogy bíróságon kellene felelnie a hazudozásai miatt addig talán nem is olyan fasiszta ez az Orbán. Ha még emlékszel, -persze csak ha érdekedben áll emlékezni- ez a notorious hazudozó nemrégen azt öklendezte ki magából ezen a lapon, hogy a reptérre fejenként 8,000 forintért viszik ki a szegény utazókat, mikőzben én egy hete másodmagammal és két nagy bőrönddel 4,800 forintért reptéri taxival (nem körbeutazva az egész várost) 35 perc alatt kényelmesen Soros György Tanítómesteretek gaztetteinek szinhelyéről (Hollán Ernő utca ha ez mond Neked valamit!) időben jutottam el a reptérre. Csak gondold végig, hogy milyen károkat okoz ez a szarkeverő szerzőtök ennek a lapnak. Mert azzal nincs baj ha valaki építő jellegű kritikával jobbítási (bocsánat ballítási) szándékkal az igazat tárja fel, de ez olyan messze áll a Ti szeretett Gyurkátoktól, mint Makó Jeruzsálemtől. A person in the possession of such a fine English name as Morrison – even if it is a fake one – surely should be able to express himself in the language given to him by his parents. Unless you are a descendant of Admiral Miklós Horthy or the Hungarian Führer, Ferenc Szálasi, two of Hungary’s finest examples of racist intolerance who are in vogue now in that country, please come back and address me in the language that is appropriate to this site. Please note: the editor now accepts pigeon English. (For proof of his magnanimity, kindly peruse the messages of Bendeguz posted on these pages over the past year.) Dolce ? P.S. You can leave the two suitcases you took with yourself to Budapest on the curb in Hollán Ernő street. I know the area well. No one will touch them there. In Hungary only politicians steal, and they live on Kossuth Square, which is another part of town. Right ? You are right. I just messed up the languages (when one speaks a few of them there is always room for mistakes). The truth is that I was using my word processor to compose a reply to your favourite Bendeguz79 about his idiocies published by KMH and overlooked the destination of my remark for you thus continued on the same page in Hungarian. Copy and Past … you know the process, don’t you? By the time I realized the mistake I already pushed the Post Comment button. My apology to all offended by this mistake. I appreciate that you read it and replied regardless of the mismatched language. It shows that your brain still works at least on the language level. On the other hand it might be time for you and all your fellow left-lib demagogues to stop the labelling machine and use factual arguments rather than the “fascist”, “racist”, “homophobe”, “xenophobe” etc., derogatory bullshits. As you can see they do not stick. Just make your comments colourful but not really interesting. If you know Hollán Ernő street than you might appreciate number 10, where my grandparents lived before the shameful time you described in several of your posts. In light of this fact you are requested to publish an apology here directed to me and my relatives for the inappropriate stamps you are working so hard to attach to me. Morrison. It might be time for you to practice what you preach. Eating humble pie now and then won’t get you to the finish line. (By the way, labeling has one “l” in it, just like the word loser.) As for the rest of the drivel in your boring little aria, I’ve no time for it. The only thing I’m sorry for is not being able to blow my sax like Sonny Rollins. Dig ? As a chess player I already see your next move, disengaging me because you are unable to win against me as your principals are faulty. Have fun my Friend. I just feel sorry for your students for being taught by such a demagogue globalist (meaning Soros surrogate). Their only hope in real life is to ignore every word you speak as soon as they are out of the University.